Sartorial grace in a timeless style, the Newport 3300 is built to rigorous technical standards and elegantly combines luxury and practicality. 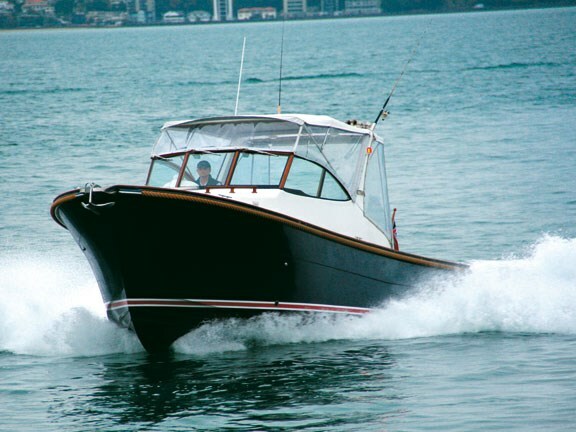 It’s another vessel from the Activa stable, marketed in New Zealand by Adventure Bay Motor Yachts. Director John Winter introduced the brand here in 2006, and says the boats have quickly found favour. The quality of workmanship from the Taiwanese Naval Architect builder is excellent, and Winter says the boats are effectively custom-built to suit local conditions. 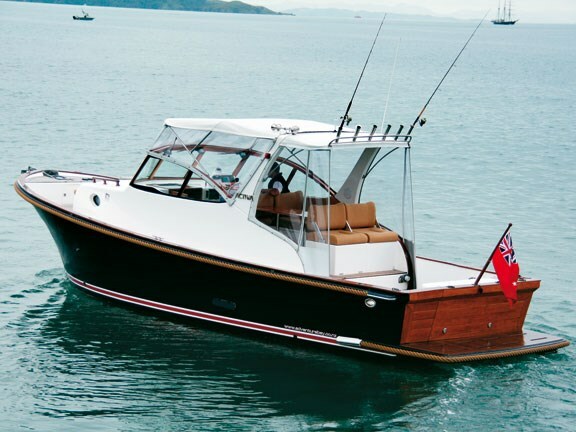 With its classic nautical styling, this boat certainly looks good. The superbly finished deep blue hull offsets the bright white cabin and topsides. Interior finishes are teak, holly and marble. And to complete the maritime theme, a thick Vetus rope belting around the gunwale makes a forgiving rubbing strake for docking and hints at the design’s Maine lobster-boat heritage. Apart from its visual appeal, a major advantage of that belting is that it can "move" and so remains undamaged by repeated rubbing. And if it does get damaged, it’s easily repaired or replaced. The hull’s constructed from solid e-glass, while cabin and superstructure use a foam- and balsa-cored composite to keep the weight down. Accommodation The Newport 3300’s configured as a sedan layout with a full walk-around cabin – an ideal multi-purpose, luxury cruiser. A 10.5m (34’6") overall length and 3.1m (10’2") beam provide plenty of space below and above deck. 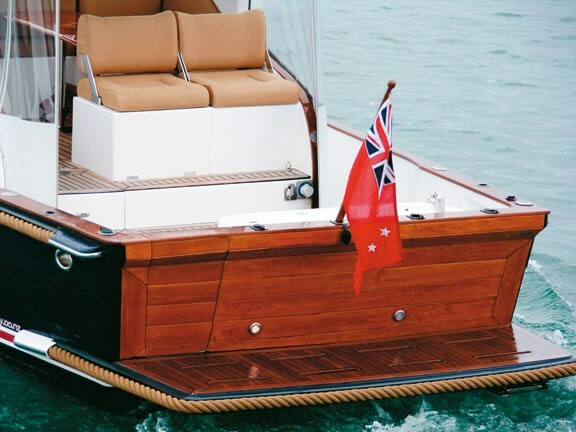 The broad bow gives the forward cabin ample space, while a high gunwale all around the boat provides a sense of security. Down in the forward cabin is a full-length queen-sized bunk in the bow area, with another double bunk amidships. 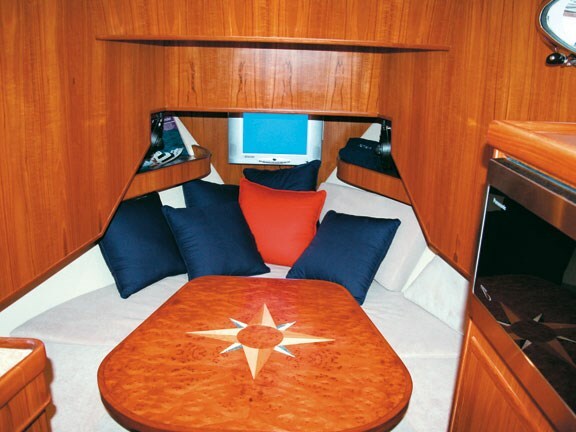 A unique paua-inlaid table, which doubles as a drop-down support for the insert on the queen bunk, turns the cabin into a cosy lounge for eating or entertaining in cooler weather. The table pivots or can be removed completely, allowing easy access to the bunks when they’re used for seating. Entertainment equipment includes a DVD player, flat-screen TV and an audio system. Galley facilities include a gas cooker, sink with running hot and cold water, microwave oven, 12v fridge and full height shower with flush toilet. The lockable cabin door affords extra security at marinas. Back in the lounge and helm area are wide, comfortable seats. 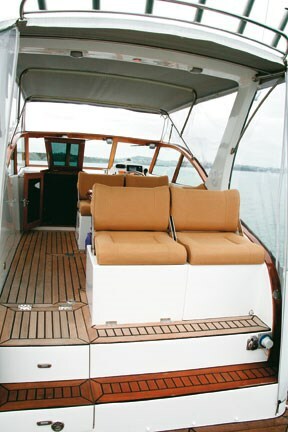 The skipper sits in a fully-upholstered model, with a 360-degree view. The lounge area has a passageway along the port side, so the forward passenger seat is alongside the skipper’s. Backrests for both seats have a clever feature – a bracket that allows them to be swung forward, instantly switching the seats from forward-facing to rear-facing. A large, stainless steel wheel is surrounded by electronic controls for the Yanmar diesel engine. 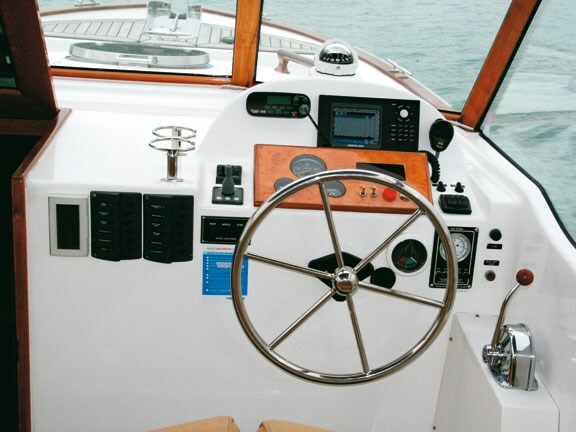 It’s an uncluttered dashboard layout, adorned with a Simrad CX30 chartplotter/sounder unit, a marine VHF radio and engine instruments – as well as controls for the trim tabs, capstan and bow thruster. 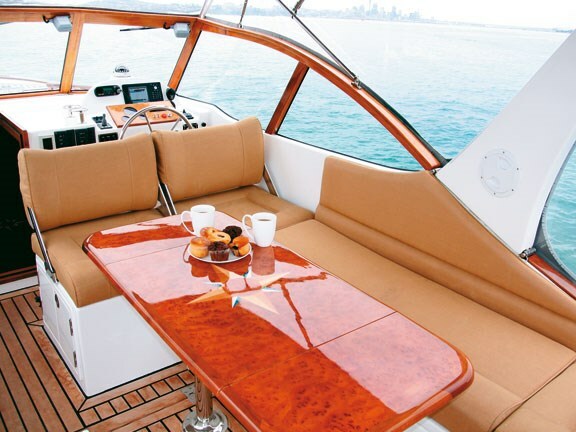 The lounge/dinette area seats six in comfort, arranged around another paua-inlaid cherrywood table. Teak flooring throughout keeps this area untroubled by wet feet, and maintenance is easy. The dinette area’s two rear seats feature the same movable backrest, enabling them to be switched to cockpit-facing seats for keeping watch on lures. Mounted on a raised floor, these seats offer excellent views out the back. When the fish bite, it’s only a single step down to be right in on the action. Cockpit Despite the boat’s genteel styling, the large cockpit was clearly designed with serious fishing in mind. 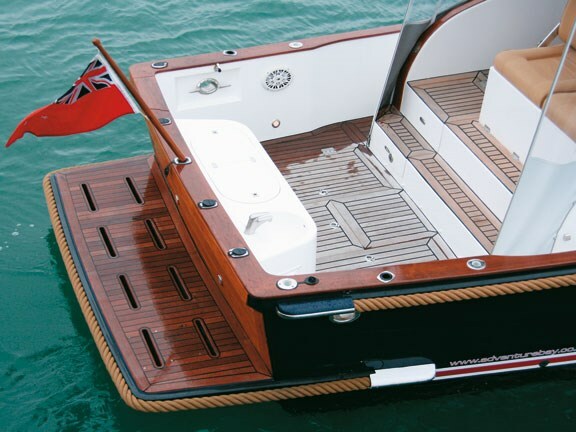 Under the teak decks are two large fishbins with macerating-pump drainage. A smaller centre hatch hides another dry storage area, and an aerated live bait tank is fitted into the transom, with a baitboard on the tank cover. A sink unit with running water takes care of the grimy fingers and a washdown hose lives in a hatch under the sink. The cockpit is self-draining and has numerous rod holders built into the gunwales and transom. Sides are high enough to provide thigh support and also wide enough for sitting. Stereo waterproof speakers deliver music to those who prefer to fish to a beat. 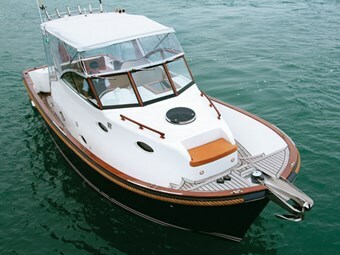 Through the transom’s sturdy hinged-door is the wide boarding platform. It serves as another fishing location (in calm conditions), and a hot shower is conveniently located for an after-swim rinsing. The edge of the boarding platform is protected by more rope belting. A zip-on cover around the back of the bimini protects the entire lounge/dinette area from the elements and also allows the use of the lounge area as a further bunk. 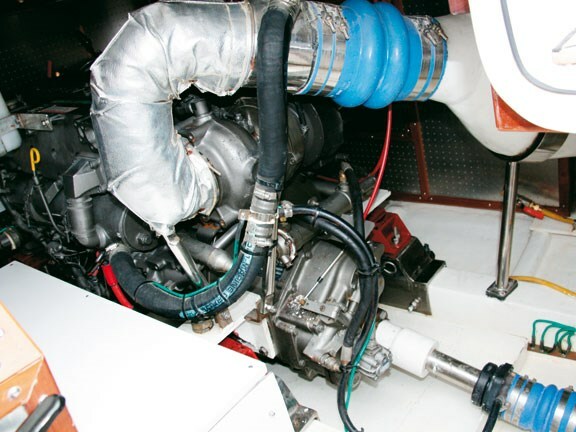 Performance Propulsion comes from a 370hp Yanmar diesel, with a tunneled shaft drive. While the whole package weighs in at around 7000kg (in luxury trim), the boat manages a respectable 21 knots at full throttle. 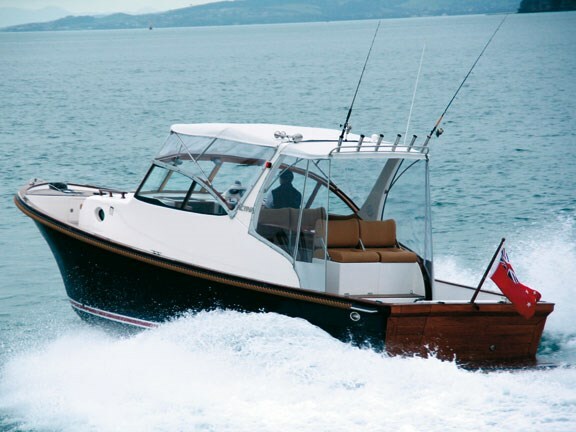 At cruising speed (16 knots) her 750-litre fuel tank provides a good range. We took the boat out for an afternoon’s fishing (which seemed almost a sacrilege given her hand-laid teak decks), and she accelerated smoothly and easily. We rapidly climbed on the plane and after trim tab adjustments, could easily see over the bows. Thanks to excellent cushioning and soundproofing, the engine did not unduly inhibit normal conversation. Seeing the boat at speed shows how well the chine keeps the spray down, and with those very high sides, this boat will need extreme conditions before she gets her top wet. Despite not being a performance planing hull, the boat lifts easily, displacing less water than one might expect. Given the cool weather, we kept the clears up but on a fine day these can be removed and the bimini top folded away. We were soon at our fishing spot and dropped the large, stainless steel plough anchor. By the time the berley was deployed, steaming hot coffee and muffins had arrived. Sadly the fish were all from the local kindergarten, so we headed off to take photos. Bringing a brand-new boat alongside a barnacle-laden wharf at mid-tide is not for the faint-hearted, but the bow thruster enabled us to position her precisely. Access to the engine room is through a hinged hatch under the lounge step. It’s clinically clean, with cables and ducting neatly arranged and with ample room all around, engine maintenance should be easy. Maintenance-free AGM batteries with a separate house bank feeding a Victron Inverter/Charger are all connected via a BEP Battery Management panel. Back at the marina, the bow thruster again made short work of manoeuvring the boat into a narrow berth. Thanks to the teak decks, clean-up is simple and before long we had her cleaned and closed up for the night. 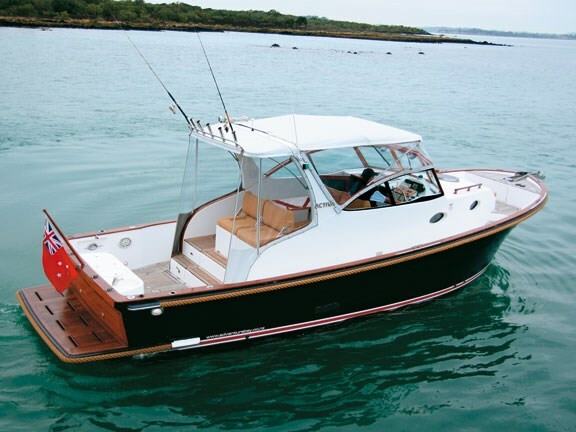 While this boat’s style might not suit everyone’s needs/tastes, it does have a functionality that will appeal to many – and a timeless style that will never go out of fashion.